For FOOD NIPPON 2016, we are focusing on the Nansei Shoto Archipelago, Japan’s chain of islands that extend from southernmost Kyushu and have been known since ancient times as a passageway for various people, objects, and cultures. 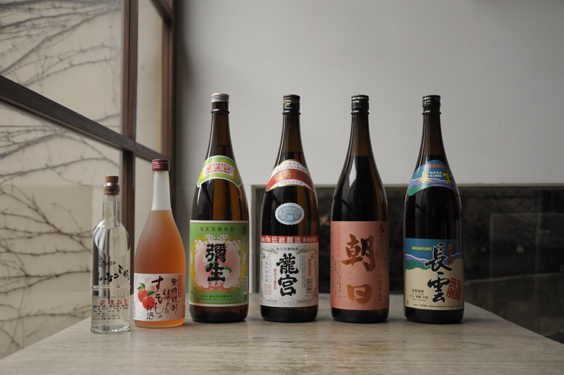 Our events taking place at HIGASHI-YAMA Tokyo in March, June, September, and December of this year will focus on the Osumi, Amami, and Yaeyama islands of the Nansei Shoto Archipelago, introducing to you carefully selected ingredients and liquor from our visits to farms and workshops in the islands, as well as original tableware produced as a result of our exchanges with local craftsmen. 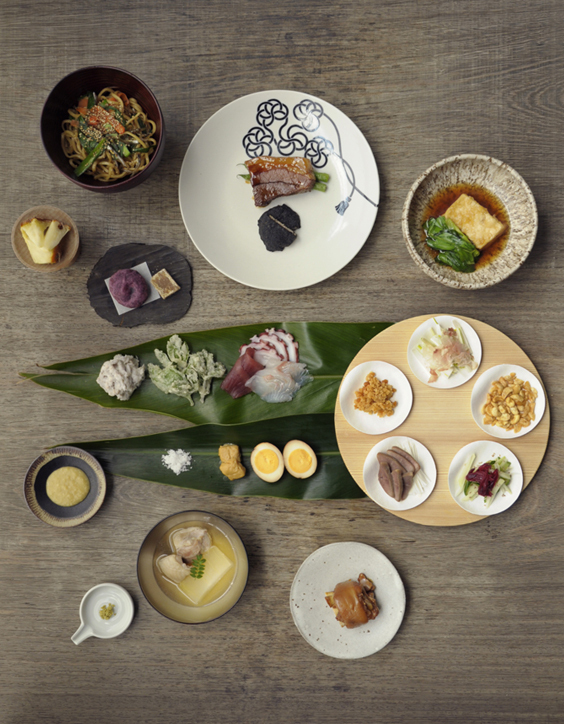 Starting Monday, March 7th, our spring event will explore the food culture of the Amami Archipelago’s Amami Oshima, Kikaijima, Tokunoshima, Okinoerabujima, and Yoronjima islands. 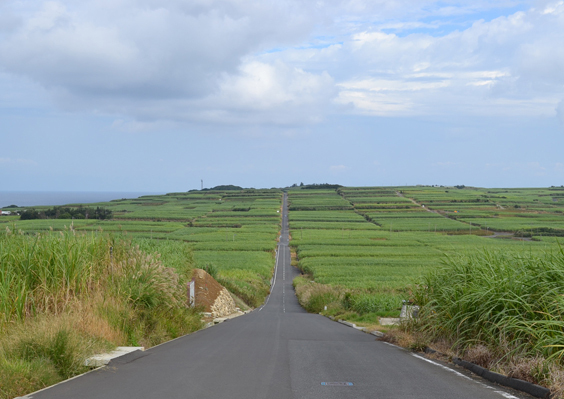 The archipelago is broadly divided into Amami Oshima and Tokunoshima islands, which used to be connected to the continent in ancient times, as well as Kikaijima, Okinoerabujima, and Yoronjima islands, which were formed by upheaved coral reefs. Through their long histories, each island has formed its own unique culture and customs by adapting to the given environmental conditions. We encountered traditional crafts cultivated by people who have long been living together with nature in Amami Oshima Island, which is home to pristine subtropical rainforests as well as many indigenous and endangered species. 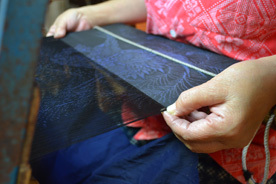 The silk yarn used to make the traditional textile “Oshima tsumugi,” which is approximately 1,300 years old, is dyed using a tree pulp called sharinbai (Rhaphiolepis umbellate). Felled from woodlands, sharinbai reacts to a type of mud in the rice fields that is rich in iron due to the influence of ancient soil. 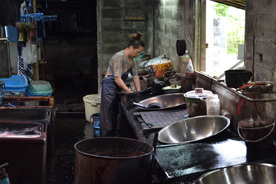 The mud is utilized in this process, and the dyeing is repeated over and over in order to create the deep black color characteristic of this textile. 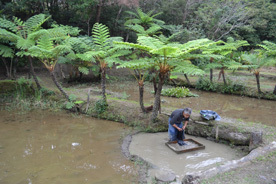 There are many living creatures in the muddy fields, and Japanese sago palms and taro potatoes – the local vegetables – are planted in order to balance the iron in the mud. 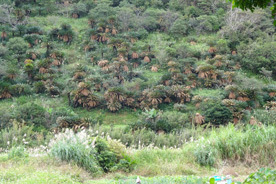 The scenery of muddy fields is representative of the tradition of “Oshima tsumugi,” which could only have occurred within Amami Oshima’s unique climate. For FOOD NIPPON, we produced original plates and chopstick rests made of both the wood and the dye of sharinbai trees in cooperation with dyer Yukihito Kanai of “Kanaikogei” and wood sculptor Junichi Hozono of “KOSHIRAERU.” We will also introduce the pottery of Masashi Mori, “Miyabikobo,” which is inspired by the nature of Amami Oshima. 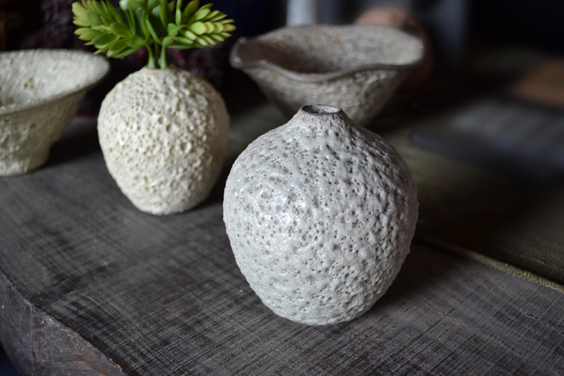 We hope you will enjoy the blessings of the land and feel the wisdom of its ancestors through the tableware of the Amami Islands. 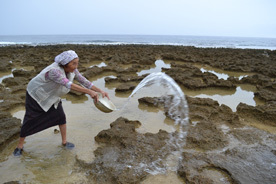 On the other hand, the island developed by upheaved coral reef, Kikaijima, is still continuing to rise at the incredible speed of 2mm per year due to its slightly alkaline soil, which has good drainage and contains the perfect amount of salt and is rich in calcium. 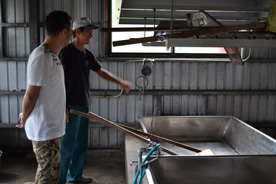 Fully taking advantage of this unique soil, sugarcane, a native species of white sesame seeds, and citrus fruits are cultivated in this island. 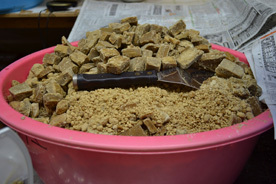 Fascinated by the brown sugar of Kikaijima, Kojiro Sugimata moved from Tokyo to the island in order to cultivate organic sugarcane and make high-quality brown sugar using a recipe from long ago. 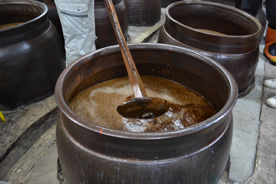 There are many charms of the Amami Islands, from natural salt made of seawater that has been sun-dried in tide pools of the coral reef and carefully boiled down by using firewood, to brown sugarcane shochu. 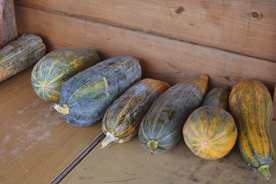 In order to share with you the rich culture we encountered during our visits with various local farmers and craftsmen, we hope you will come to enjoy the food of the Amami Islands. We will serve shochu and liquor from selected distillers including four different brands of Amami brown sugarcane shochu from Ichinojo Asahi of Asahi Shuzo from Kikaijima, “Minaminoshima-no-Kifujin” which is known for its extremely condensed umami flavor, and Amami Plum Wine in which island plums are soaked in “Sato-no-Akebono” brown sugarcane shochu. We hope you will enjoy these special drinks alongside our dishes of the Amami Islands.